With more than 350 wineries, Texas is the fifth largest wine-producing state. Earning such accolades as one of “the 10 best wine travel destinations in the world,” Texas is home to skillfully crafted wines that regularly earn gold, silver, and bronze medals in competitions around the globe. Home to some of the state’s best wineries, the Texas Hill Country is a key destination for first time vineyard visitors as well as winery veterans. A must-do for any trip to the Hill Country wine region is Fredericksburg, Texas, part of the Texas Hill Country Wine Trail and home to some of the oldest wineries in the state. Fredericksburg cultivates more than half of the world’s grape varietals and is located just a short drive west of Austin and San Antonio. The quaint town includes notable wineries such as Fall Creek Vineyards and Becker Vineyards, whose 2013 Provencal won a double gold medal at the 2014 San Francisco International Wine Competition. While in Fredericksburg, experience some of the town’s authentic German culture, which comes across in its food, festivals and architecture, as German immigrants settled the town over 160 years ago. Set in the Texas Hill Country and surrounded on all sides by vineyards, the Fall Creek Vineyards offers tastings and tours along with guest quarters that combine early Texas and antique country French and English furnishings. The vineyards’ 400-acre growing site, selected and purchased in 1975 for its unique soil and climatic conditions, is located on the northwest shores of Lake Buchanan in the heart of the Hill Country. Fall Creek was recently awarded a Double Gold Medal in the 2013 Tasters Guild International Wine Competition, and its founder, Susan Auler, was recognized by Wines and Vines as one of the top 50 people in the world wine industry. Located between Fredericksburg and Johnson City, the Becker Vineyards site was chosen for its bounty of native Mustang grapes, a time honored component of the local German Heritage. The vineyard was even named one of the most picturesque wineries in the country by HGTV. Tours are available seven days a week and Becker Vineyards holds an annual grape stomp in August. Outside of the Hill Country, prolific wine producers can be found across the state. Val Verde Winery in Del Rio, just a few blocks from the Texas-Mexico border, was founded in 1883 when an Italian immigrant named Frencesco “Frank” Qualia moved to the area and discovered Lenoir grapes flourishing there. The current fourth-generation Qualia vintner still uses Frank’s family traditions from the Old Country to produce a highly respected variety of reds and whites, including an award-winning Port blend, as well as a very popular Texas rosé. Northeast of Dallas, the city of Grapevine is home to an Urban Wine Trail consisting of eight wineries. Visitors can take a wine train or guided tour of the wineries, or plan their own individual tours. If you plan a trip in September, make sure to attend GrapeFest, the largest wine festival in the Southwest. 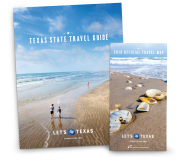 Wineries, beautiful views and scenic towns leave visitors feeling relaxed and at home in Texas. Our wineries invite you to sit, sip, and stay awhile, and we guarantee that when you leave you’ll already be thinking about your next trip back.